Who's Clip Clopping Over My Bridge? Installation inside Deutzer Brucke for exhibition 'Dudelsack', Cologne, Germany, 2005. 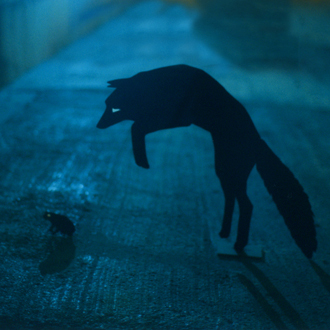 Installation based on the idea of wild animals hiding in an urban space, only visible as silhouettes with bright eyes shining as the light beam finds them. 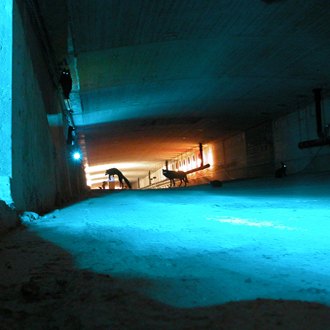 Exhibition took place in the tunnel-like closed concrete room inside a bridge over the river Rhine. Card, wood, paint, reflective textile, sound, and motion-sensor controlled spotlights.